We know we need to build the right competencies to deliver results, so how do we create a strategy, structure, and culture to successfully translate unorthodox ideas to true innovation? 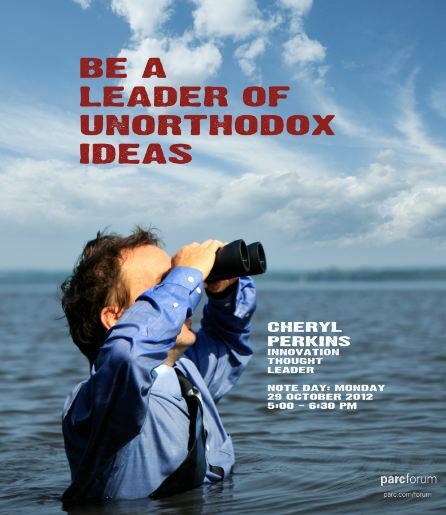 Next month I am going to present Be a Leader of Unorthodox Ideas, a special innovation presentation in Palo Alto, Calif. I’m doing this because I think it is vitally important for leaders to share best practices; especially those leaders who can identify and act on unorthodox ideas to deliver top-line growth and true innovation in today’s business climate. Companies cannot afford to stand still. We’re going to collaborate on ideas for taking innovation to the next step while tackling the current challenges of talent management. We’re also going to learn how to better engage internal stakeholders and overcome barriers to personal and corporate success as discussed in the book Conquering Innovation Fatigue. I am excited to do this presentation as part of the PARC Forum. PARC is a Xerox company that brings leaders together to learn about open innovation, how to create new business options, accelerate time to market, augment internal capabilities, and reduce risk. If you are in the Palo Alto area, join me at the George E. Pake Auditorium on Monday, Oct. 29 at 7 p.m. Details are over on the PARC site. My hope is that you will walk away inspired and motivated to advance their leadership skills to leverage unorthodox ideas in new ways from building new capabilities, changing culture, piloting several innovation approaches, and tailoring unique solutions to win in very competitive markets. ← Finger scanners get schooled!